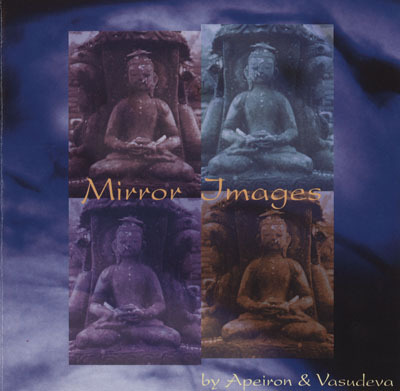 German synthesist Apeiron had two excellent Berlin school electronic music albums in the early 90s, Imagic and Twilight People. He has resurfaced, this time with collaborator Vasudeva, who has added a considerable world beat and flavor to the proceedings. There are strong hints of the old Apeiron sound on “Homecoming,” the first of the three-part “Green Island Suite.” Soft atmospherics and bells are joined by tribal percussion and great synth lead lines, as well as strong sequencing. After a few minutes, it abruptly segues into “The Village,” a very world-sounding piece. This is followed by “The Dance,” which is a smooth blending of the electronics and primitive sounds. It works very well. “Echoes of Childhood” also blends both influences to great effect, having a very dream-like quality. “Awakening” continues to stretch the boundaries of Apeiron’s wistful, faraway sounds from what he has previously done. Trumpet adds a unique touch here. An interesting departure from traditional Teutonics, worth exploring.